Mapex Heavy Rock Kit, Virtual Drum/Percussion from Drumdrops. Drum Drops introduces the Mapex Rock Kit, a new library for large rock sound fans, available in 5 versions, including Kontakt. Drum Drops sampled for this kit Jason Bowld’s Mapex Saturn drums (Bullet For My Valentine, Killing Joke), along with three snares, including the famous Black Panther Hammered Series in Phosphor Bronze, three crash cymbals, a china and a ride. The kit was recorded at the Garden Studios in London with 16 velocity layers, multiple round robins and articulations. 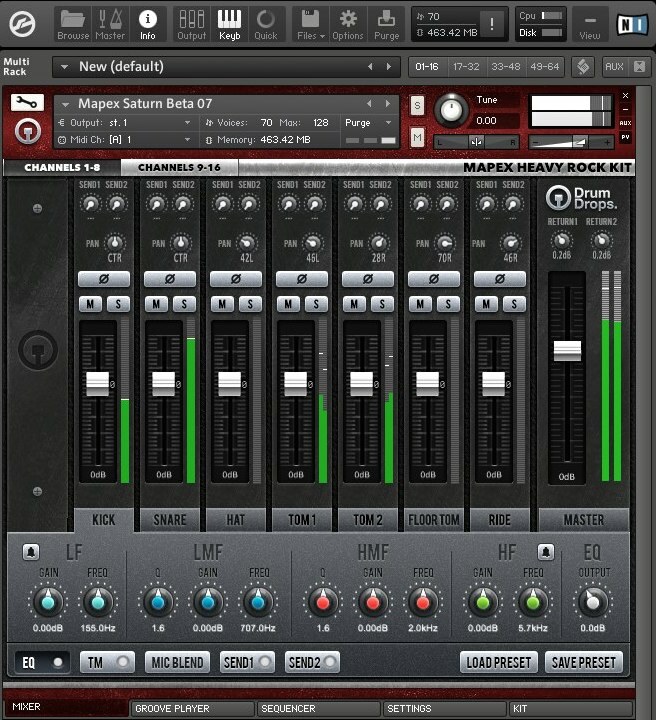 The Kontakt Pack features 7116 samples, with 41 articulations, a 9-channel mixer, each with a 4-band EQ and a Transient Master, a convolution reverb with multiple IRs, velocity curve and drum tuning adjustment, a MIDI groove player, a step sequencer, a groove slicer and a Mic Bend feature. A randomization function, a buss compressor and a tape saturation emulation are also available. This edition is available for 60.20€ / $82 / £50 and includes two full and light versions for desktops and laptops. The Multi-Velocity Pack offers 481 samples in total, with presets for the latest versions of Battery, Kontakt, EXS24 (Logic), Geist, Studio One, Ableton Drum Rack, Reason ReFill and iDrum, as well as WAV 24-bit files for use in any compatible sampler or drum machine. MIDI maps are also included. This pack retails for 18.06€ / $24.60 / £15. The Drum Replacement Pack features three templates for the Slate Trigger v2, Drumagog v5 and DrumXchanger software. Each template uses a different number of samples according to the host capacities. Pricing is 18.06€ / $24.60 / £15. The All Sample Pack only offers WAV 24-bit files, without any preset/template. This pack is organized into two categories, the first one with samples from the Kontakt 5 pack with the three mic positions, 16 velocity layers and 3 round robins while the second are the stereo mixed files from the Multi-Velocity pack. In total, this version features almost 3000 samples. This edition retails for 36.12€ / $49.20 / £30. You can listen to demos at drumdrops.com. 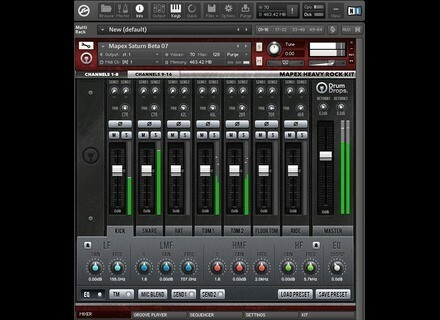 You’re invited to test FL Studio 12 Image Line invites its FL Studio users to test the alpha 12 version of its DAW. Free BeatFinder! app for your iDevice BeatFinder! is a very simple free app that allows for convertir on your Apple iDevice time into tempo and vice versa. Analogue Drums releases Boxer Boxer, the new Analogue Drums library, includes instruments for Kontakt, WAV files and presets for TCI/PRS triggers.